Siding does a lot more than bringing your home’s exterior elements together. Aside from giving your home impressive curb appeal, it also helps protect from the elements and weather. And as a crucial insulating factor of your home, siding also aids in keeping it comfortable and energy-efficient year-round. These are the primary reasons why you should carefully select the type of siding that you’ll get for your home. If you’re looking to improve your home’s appearance, Exterior Source offers the siding and trim options from CertainTeed, one of the most trusted names in siding and other building materials. Rated #1 by Building Professionals – For 20 straight years, surveys by independent agencies from major trades have shown that CertainTeed is the brand most preferred by building professionals, from architects and designers to builders and remodelers. Color and Style Leadership – CertainTeed offers the biggest selection of modern siding colors and styles available in the industry. They are the first to introduce unique and darker siding color shades. CertainTeed siding products also come with a broad choice of styles that are sure to complement any home’s architectural style. They Lead The Way in Cedar Shingle Siding – CertainTeed is currently the only manufacturer that offers two options for cedar shingle siding. CertainTeed Products Are Environment-Friendly – Insulated siding options from CertainTeed can insulate a building’s entire wall, up to the studs, increasing the overall thermal performance of your home. As a result, heating and cooling costs are reduced. 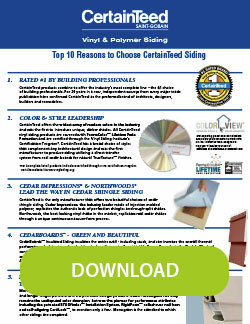 Furthermore, CertainTeed also has siding options that are composed mostly of recycled materials. Over 100 Years of Building Products Leadership – CertainTeed has been one of the nation’s largest and most reputable companies that manufacture high-quality building products. Established in 1904, it has remained a brand trusted by both property owners and construction professionals. Exterior Source carries various CertainTeed siding product lines including Cedar Impressions™, CedarBoards™ insulated siding, and vinyl siding. Cedar Impressions Shakes offers the rugged charm of cedar without the costly price and maintenance. CedarBoards Insulated Siding gives the comprehensive look of real wood plank siding. With a built-in layer of insulation, this siding can make your home comfortable and energy-efficient all year round. CertainTeed Vinyl Siding comes in many types: Monogram, MainStreet, and Carolina Beaded. You can choose between classic woodgrain and smooth styles, allowing you to get what best matches your home. 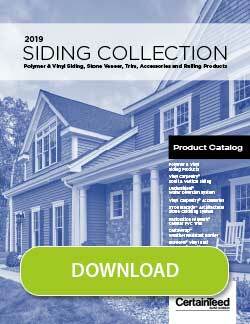 As a CertainTeed 5-Star Contractor for vinyl siding and trim, Exterior Source is your best source for these excellent siding options. Call 804-275-5323 (Richmond) or 757-464-2060 (Tidewater) today to learn more about the CertainTeed siding options that we offer and their benefits. You can also message us through our contact form to schedule a free consultation and estimate.